Happy SUMMER!!!! Today is my favorite day of the year because it’s the longest and that just makes me happy. Evan and I are having a dinner picnic tonight. I.LOVE.PICNICS! It’s really starting to warm up here and I’m looking forward to taking a dip in our very cold pool this weekend, there’s no heater so the warm summer months are really the only time we get to enjoy it. I’m also excited for my good friends’ outdoor movie night tomorrow. I’m bringing popcorn with delicious toppings and syrups to make boozy sodas. 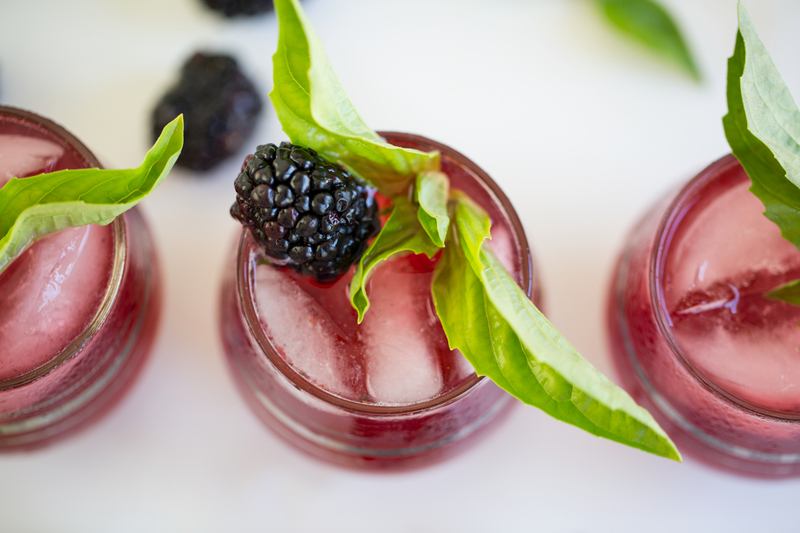 Wash berries and basil. Place them in a cocktail shaker and muddle. Add lime juice, ginger syrup, and Bourbon. Fill about 1/2 way with ice. Shake well, until the shaker gets frosty on the outside. Pour into a lowball glass filled with ice and top with chilled ginger beer. 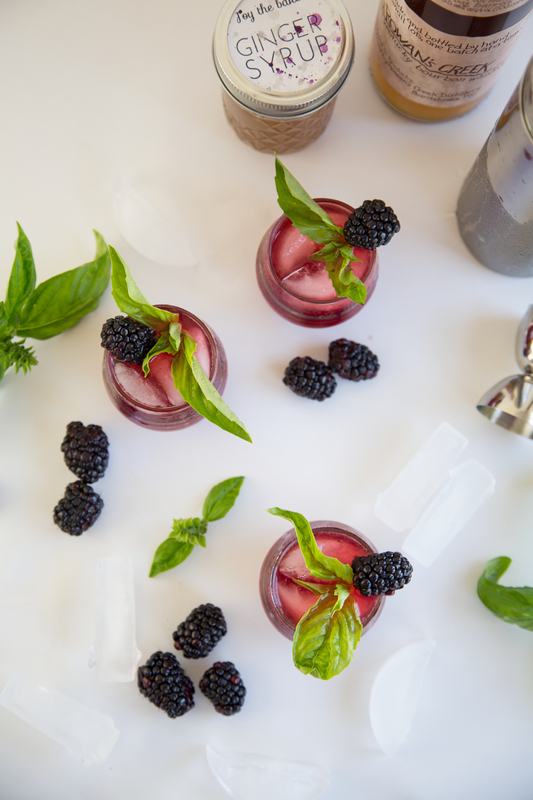 Garnish with blackberries and basil. CHEERS!!! Sounds so fresh and yummy if makes me wish I were a drinker! Yummmm it’s all of my favorite things! Sounds cool and refreshing — Happy Summer! I love the drink recipes you are providing me with! :) I actually made the watermelon, mint and gin drink last friday! I took brought out the juicer and juiced a whole watermelon! It was fantastic. We had friends over and it was a big hit! Thank you! I love basil and fruit together! Great drink recipe! This sounds delicious! 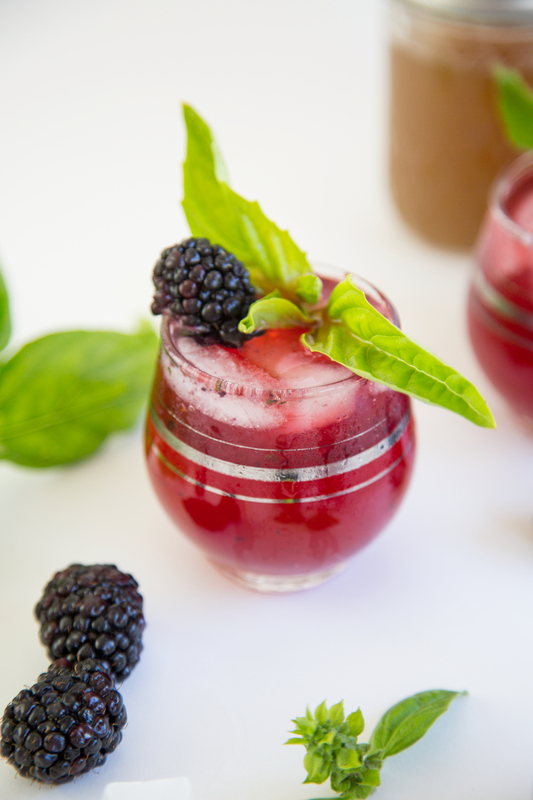 Blackberry drinks are so rare, yet they’re one of my absolute favorite fruits! This looks beautiful. I love that I have some of these ingredients in the backyard. If only I lived in a berry growing climate. C’est la vie. I can’t wait to try this. june 21st is my favorite day of the year too!!!! also.. these cocktails look so lovely! yeaaa girl! Favorite day twinsies! Wut wut! You’re ginger syrup really made this drink! I’m heading to the store right now to get the things needed for this! Monday happy hour?! I like your style :) CHEERS! I absolutely love all of your photos, they’re great!